It’s hard to overestimate the role of accuracy in SEO, especially when you’re conducting a site audit. And as an SEO specialist, when you look through a site audit report, you can easily check and tell real issues reported for the website from those that are irrelevant. However, when you need to show the report to someone else, like your clients or co-workers, explaining all the details might not be as simple. 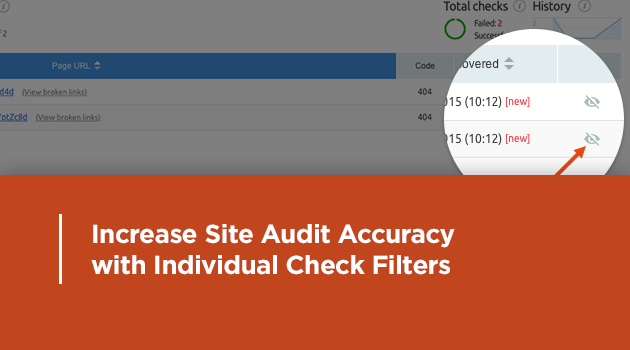 That’s why with this update to the Site Audit Tool, we’re introducing individual check filters! These allow SEMrush users to manually exclude specific issues from the Site Audit report and thus get extremely accurate metrics on their website’s overall health. When you inspect individual issues discovered by the Site Audit tool, you can test whether those issues are caused by real problems with your website or something else. For example, you might sometimes get a 4xx error for a webpage that works fine but blocks SEMrush crawlers. Now you can choose to exclude such issues from your report by pressing the new ‘Hide Results’ button on the right side of the interface. Hiding specific issues will not only exclude them from the list of issues, but will also positively affect your overall Site Audit score, providing you with a more accurate overview of your website’s health. You can always review excluded issues and undo all changes by clicking on the ‘+ Hidden’ line under the ‘Total Checks’ section of the report. We hope you like this update! If you have any comments or suggestions about the Site Audit tool, please feel free to drop us a line at [email protected]. Thank you for helping us make SEMrush better.